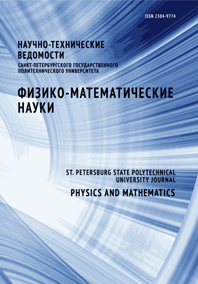 Lobachev Aleksandr M. Polyanskiy Vladimir A. Modestov Victor S. Pivkov Andrey V.
This paper is devoted to the finite-element modeling (FEM ) of elastic waves сaused by the work of a piezoactuator. For this purpose, a mathematical model of the ‘elastic layer – piezoelectric element’ system has been developed. In the terms of the model, the simultaneous solution of the piezoelectricity and the solid-mechanics equations was employed. This model allowed us to describe the propagation process of high-frequency mechanical vibrations, caused by the application of the probing electrical pulse to the electrodes of the piezoelectric element (the vibrations occur in the elastic layer) and to reproduce the potential difference arising in the reception of the reflected wave. The influence of t-parameters of the FEM and numerical integration scheme on the calculation results was investigated. The essential sensitivity of the reflected-wave’s delay-time to the integrating time-step was found.